The Dillwyn, VA area has had 8 reports of on-the-ground hail by trained spotters, and has been under severe weather warnings 45 times during the past 12 months. 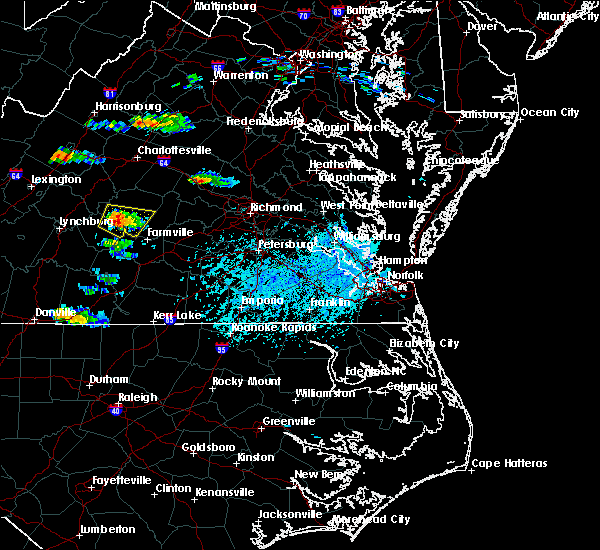 Doppler radar has detected hail at or near Dillwyn, VA on 32 occasions, including 4 occasions during the past year. 4/19/2019 6:24 PM EDT The tornado warning for eastern buckingham county will expire at 630 pm edt, the storm which prompted the warning has weakened below severe limits, and has exited the warned area. therefore, the warning will be allowed to expire. however heavy rain is still possible with this thunderstorm. a tornado watch remains in effect until 800 pm edt for central and south central virginia. when it is safe to do so, please send your reports of hail of any size, as well as reports of any wind damage, including downed trees or large limbs, to the national weather service by calling toll free at 1, 8 6 6, 2 1 5, 4 3 2 4. reports and pictures can also be shared on the national weather service blacksburg facebook page and on twitter. 4/19/2019 6:18 PM EDT At 617 pm edt, a severe thunderstorm capable of producing a tornado was located over new canton, moving northeast at 40 mph (radar indicated rotation). Hazards include tornado. Flying debris will be dangerous to those caught without shelter. mobile homes will be damaged or destroyed. damage to roofs, windows, and vehicles will occur. tree damage is likely. Locations impacted include, dillwyn, new canton, gold hill, sheppards, and andersonville. 4/19/2019 6:02 PM EDT At 602 pm edt, a severe thunderstorm capable of producing a tornado was located near dillwyn, moving northeast at 45 mph (radar indicated rotation). Hazards include tornado. Flying debris will be dangerous to those caught without shelter. mobile homes will be damaged or destroyed. damage to roofs, windows, and vehicles will occur. tree damage is likely. Locations impacted include, dillwyn, new canton, gold hill, sheppards, and andersonville. 4/19/2019 5:39 PM EDT At 539 pm edt, a severe thunderstorm capable of producing a tornado was located over prospect, moving northeast at 40 mph (radar indicated rotation). Hazards include tornado. Flying debris will be dangerous to those caught without shelter. mobile homes will be damaged or destroyed. damage to roofs, windows, and vehicles will occur. Tree damage is likely. 4/15/2019 12:32 AM EDT At 1232 am edt, a severe thunderstorm was located over gold hill, moving northeast at 70 mph (radar indicated). Hazards include 60 mph wind gusts and quarter size hail. Hail damage to vehicles is expected. expect wind damage to roofs, siding, and trees. locations impacted include, buckingham, dillwyn, toga, centenary, and sheppards. 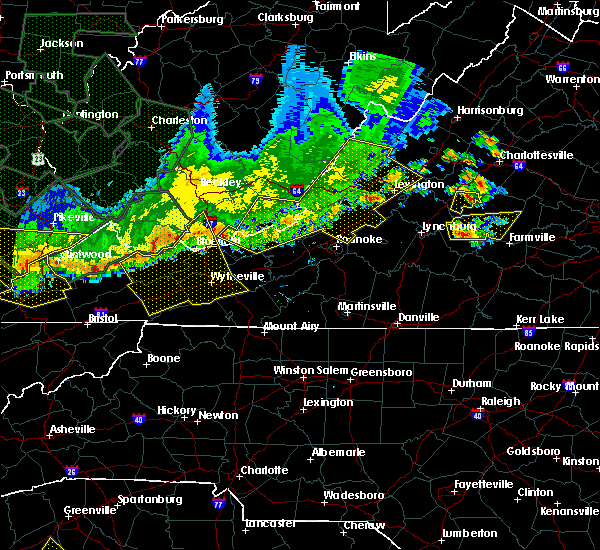 A tornado watch remains in effect until 500 am edt for central and south central virginia. 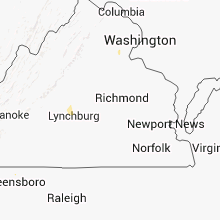 4/15/2019 12:28 AM EDT The severe thunderstorm warning for central appomattox and buckingham counties will expire at 1230 am edt, the storm which prompted the warning has moved out of appomattox county. therefore, the warning will be allowed to expire. a tornado watch remains in effect until 500 am edt for central and south central virginia. when it is safe to do so, please send your reports of hail of any size, as well as reports of any wind damage, including downed trees or large limbs, to the national weather service by calling toll free at 1, 8 6 6, 2 1 5, 4 3 2 4. reports and pictures can also be shared on the national weather service blacksburg facebook page and on twitter. remember, a severe thunderstorm warning still remains in effect for buckingham county until 1:15am. 4/15/2019 12:23 AM EDT At 1222 am edt, a severe thunderstorm was located over andersonville, moving northeast at 50 mph (radar indicated). Hazards include 60 mph wind gusts and quarter size hail. Hail damage to vehicles is expected. Expect wind damage to roofs, siding, and trees. 4/15/2019 12:13 AM EDT At 1212 am edt, a severe thunderstorm was located near hixburg, moving northeast at 50 mph (radar indicated). Hazards include 60 mph wind gusts. Expect damage to roofs, siding, and trees. locations impacted include, buckingham, appomattox, dillwyn, bent creek, and appomattox national historic park. A tornado watch remains in effect until 500 am edt for central and south central virginia. 4/15/2019 12:00 AM EDT At 1200 am edt, a severe thunderstorm was located near tower hill, moving northeast at 55 mph (radar indicated). Hazards include 60 mph wind gusts. Expect damage to roofs, siding, and trees. locations impacted include, buckingham, appomattox, brookneal, dillwyn, and bent creek. A tornado watch remains in effect until 500 am edt for central and south central virginia. 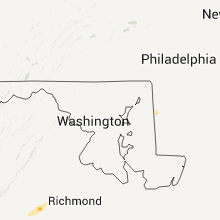 4/8/2019 5:38 PM EDT At 538 pm edt, severe thunderstorms were located along a line extending from dillwyn to appomattox national historic park to straightstone, moving east at 30 mph (radar indicated). Hazards include 60 mph wind gusts and quarter size hail. Hail damage to vehicles is expected. expect wind damage to roofs, siding, and trees. Locations impacted include, buckingham, dillwyn, new canton, centenary, and sheppards. 4/8/2019 5:28 PM EDT At 528 pm edt, severe thunderstorms were located along a line extending from buckingham to spout spring to near straightstone, moving east at 30 mph (radar indicated). Hazards include 60 mph wind gusts and quarter size hail. Hail damage to vehicles is expected. expect wind damage to roofs, siding, and trees. Locations impacted include, buckingham, appomattox, dillwyn, bent creek, and pamplin city. 4/8/2019 5:08 PM EDT At 508 pm edt, severe thunderstorms were located along a line extending from near wingina to near bocock to near leesville, moving east at 30 mph (radar indicated). Hazards include 60 mph wind gusts and quarter size hail. Hail damage to vehicles is expected. expect wind damage to roofs, siding, and trees. Locations impacted include, buckingham, appomattox, dillwyn, concord, and rustburg. 4/8/2019 4:41 PM EDT At 439 pm edt, severe thunderstorms were located along a line extending from near amherst to near goode to north shore, moving east at 30 mph (radar indicated). Hazards include 60 mph wind gusts and quarter size hail. Hail damage to vehicles is expected. Expect wind damage to roofs, siding, and trees. 10/11/2018 5:28 PM EDT At 524 pm edt, severe thunderstorms were located along a line extending from near new canton to near andersonville, moving west at 15 mph (radar indicated). Hazards include 70 mph wind gusts. Expect considerable tree damage. damage is likely to mobile homes, roofs, and outbuildings. locations impacted include, buckingham, dillwyn, new canton, toga, and centenary. A tornado watch remains in effect until 900 pm edt for central and south central virginia. 10/11/2018 4:52 PM EDT At 451 pm edt, severe thunderstorms were located along a line extending from near new canton to andersonville, moving northwest at 15 mph (radar indicated). Hazards include 70 mph wind gusts. Expect considerable tree damage. Damage is likely to mobile homes, roofs, and outbuildings. 8/13/2018 7:05 PM EDT The severe thunderstorm warning for appomattox and central buckingham counties will expire at 715 pm edt, the storms which prompted the warning have weakened below severe limits, and have exited the warned area. therefore, the warning will be allowed to expire. when it is safe to do so, please send your reports of hail of any size, as well as reports of any wind damage, including downed trees or large limbs, to the national weather service by calling toll free at 1, 8 6 6, 2 1 5, 4 3 2 4. reports and pictures can also be shared on the national weather service blacksburg facebook page and on twitter. 8/13/2018 6:50 PM EDT At 650 pm edt, severe thunderstorms were located along a line extending from near lakeside village to near hixburg, moving east at 20 mph (radar indicated). Hazards include 60 mph wind gusts and quarter size hail. Hail damage to vehicles is expected. expect wind damage to roofs, siding, and trees. Locations impacted include, buckingham, appomattox, dillwyn, pamplin city, and appomattox national historic park. 8/13/2018 6:32 PM EDT At 631 pm edt, severe thunderstorms were located along a line extending from near new canton to near hixburg, moving east at 20 mph (radar indicated). Hazards include 60 mph wind gusts and quarter size hail. Hail damage to vehicles is expected. expect wind damage to roofs, siding, and trees. Locations impacted include, buckingham, appomattox, dillwyn, pamplin city, and appomattox national historic park. 8/13/2018 6:08 PM EDT At 608 pm edt, severe thunderstorms were located along a line extending from near gold hill to appomattox, moving east at 20 mph (radar indicated). Hazards include 60 mph wind gusts and quarter size hail. Hail damage to vehicles is expected. Expect wind damage to roofs, siding, and trees. 8/8/2018 7:57 PM EDT At 756 pm edt, severe thunderstorms were located along a line extending from near hadensville to near new canton to near wingina, moving east at 25 mph (radar indicated). Hazards include 60 mph wind gusts and quarter size hail. Hail damage to vehicles is expected. expect wind damage to roofs, siding, and trees. Locations impacted include, buckingham, dillwyn, new canton, toga, and centenary. 8/8/2018 7:22 PM EDT At 721 pm edt, severe thunderstorms were located along a line extending from near kents store to centenary to clifford, moving east at 25 mph (radar indicated. 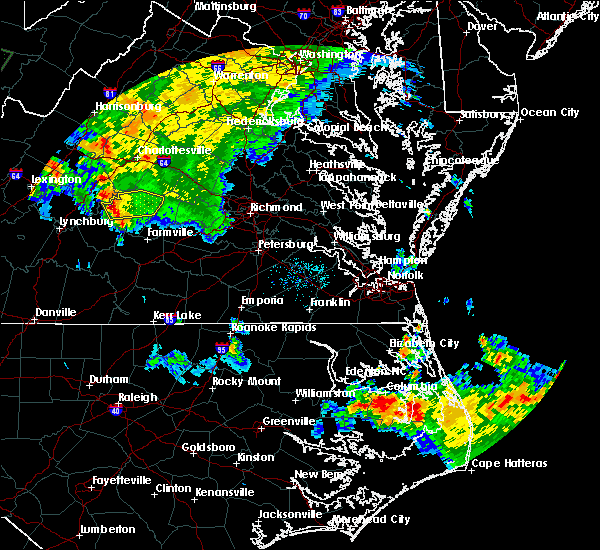 damage was reported just to the north with this same line of thunderstorms in albemarle county). Hazards include 60 mph wind gusts and quarter size hail. Hail damage to vehicles is expected. Expect wind damage to roofs, siding, and trees. 8/1/2018 9:55 PM EDT The severe thunderstorm warning for eastern buckingham county will expire at 1000 pm edt, the storms which prompted the warning have weakened below severe limits, and have exited the warned area. therefore, the warning will be allowed to expire. when it is safe to do so, please send your reports of hail of any size, as well as reports of any wind damage, including downed trees or large limbs, to the national weather service by calling toll free at 1, 8 6 6, 2 1 5, 4 3 2 4. reports and pictures can also be shared on the national weather service blacksburg facebook page and on twitter. 8/1/2018 9:35 PM EDT At 934 pm edt, severe thunderstorms were located along a line extending from near new canton to near tower hill, moving northeast at 30 mph (radar indicated). Hazards include 60 mph wind gusts. Expect damage to roofs, siding, and trees. Locations impacted include, dillwyn, new canton, and gold hill. 8/1/2018 9:16 PM EDT At 916 pm edt, severe thunderstorms were located along a line extending from near gold hill to near appomattox national historic park, moving northeast at 30 mph (radar indicated). Hazards include 60 mph wind gusts. Expect damage to roofs, siding, and trees. Locations impacted include, buckingham, dillwyn, new canton, toga, and centenary. 8/1/2018 9:02 PM EDT At 902 pm edt, severe thunderstorms were located along a line extending from near guinea mills to appomattox, moving northeast at 30 mph (radar indicated). Hazards include 60 mph wind gusts. Expect damage to roofs, siding, and trees. Locations impacted include, buckingham, appomattox, dillwyn, bent creek, and pamplin city. 7/28/2018 12:10 AM EDT At 1154 pm edt, a severe thunderstorm was located near dillwyn, moving east at 20 mph (radar indicated). Hazards include 60 mph wind gusts and quarter size hail. Hail damage to vehicles is expected. expect wind damage to roofs, siding, and trees. Locations impacted include, dillwyn, pamplin city, madisonville, toga, and abilene. 7/27/2018 11:54 PM EDT At 1154 pm edt, a severe thunderstorm was located near dillwyn, moving east at 20 mph (radar indicated). Hazards include 60 mph wind gusts and quarter size hail. Hail damage to vehicles is expected. expect wind damage to roofs, siding, and trees. Locations impacted include, dillwyn, pamplin city, madisonville, toga, and abilene. 7/27/2018 11:42 PM EDT At 1141 pm edt, severe thunderstorms were located near hixburg and dillwyn, moving east at 25 mph (radar indicated). Hazards include 60 mph wind gusts and quarter size hail. Hail damage to vehicles is expected. expect wind damage to roofs, siding, and trees. Locations impacted include, buckingham, appomattox, dillwyn, phenix, and red house. 7/27/2018 11:28 PM EDT At 1126 pm edt, severe thunderstorms were located over cullen and near spring mills, moving east at 20 mph (radar indicated). Hazards include 60 mph wind gusts and quarter size hail. Hail damage to vehicles is expected. expect wind damage to roofs, siding, and trees. Locations impacted include, buckingham, appomattox, dillwyn, phenix, and red house. 7/27/2018 11:19 PM EDT At 1114 pm edt, severe thunderstorms were located near evergreen, moving east at 25 mph (radar indicated). Hazards include 60 mph wind gusts and quarter size hail. Hail damage to vehicles is expected. Expect wind damage to roofs, siding, and trees. 6/24/2018 5:10 PM EDT The severe thunderstorm warning for southeastern buckingham county will expire at 515 pm edt, the storm which prompted the warning has moved out of the area. therefore, the warning will be allowed to expire. when it is safe to do so, please send your reports of hail of any size, as well as reports of any wind damage, including downed trees or large limbs, to the national weather service by calling toll free at 1, 8 6 6, 2 1 5, 4 3 2 4. reports and pictures can also be shared on the national weather service blacksburg facebook page and on twitter. 6/24/2018 4:47 PM EDT At 446 pm edt, a severe thunderstorm was located near dillwyn, moving east at 40 mph (radar indicated). Hazards include 60 mph wind gusts and quarter size hail. Hail damage to vehicles is expected. expect wind damage to roofs, siding, and trees. Locations impacted include, buckingham, dillwyn, sheppards, and andersonville. 6/24/2018 4:30 PM EDT At 429 pm edt, a severe thunderstorm was located near toga, moving east at 35 mph (radar indicated). Hazards include golf ball size hail and 70 mph wind gusts. People and animals outdoors will be injured. expect hail damage to roofs, siding, windows, and vehicles. expect considerable tree damage. wind damage is also likely to mobile homes, roofs, and outbuildings. Locations impacted include, buckingham, dillwyn, toga, sheppards, and andersonville. 6/24/2018 4:15 PM EDT At 415 pm edt, a severe thunderstorm was located near wingina, moving east at 35 mph (radar indicated). Hazards include 60 mph wind gusts and half dollar size hail. Hail damage to vehicles is expected. Expect wind damage to roofs, siding, and trees. 6/10/2018 6:20 PM EDT At 620 pm edt, a severe thunderstorm was located near sheppards, moving northeast at 20 mph (radar indicated). Hazards include 60 mph wind gusts and quarter size hail. Hail damage to vehicles is expected. Expect wind damage to roofs, siding, and trees. 6/10/2018 4:52 PM EDT At 451 pm edt, severe thunderstorms were developing from near centenary to near toga, moving east at 20 mph (radar indicated). Hazards include 60 mph wind gusts and quarter size hail. Hail damage to vehicles is expected. Expect wind damage to roofs, siding, and trees. 5/20/2018 7:57 PM EDT At 737 pm edt, severe thunderstorms were located along a line extending from near shipman to near centenary to near trenholm, moving southeast at 20 mph (radar indicated). Hazards include 60 mph wind gusts and quarter size hail. Hail damage to vehicles is expected. expect wind damage to roofs, siding, and trees. Locations impacted include, buckingham, dillwyn, wingina, gold hill, and centenary. 5/20/2018 7:37 PM EDT At 737 pm edt, severe thunderstorms were located along a line extending from near shipman to near centenary to near trenholm, moving southeast at 20 mph (radar indicated). Hazards include 60 mph wind gusts and quarter size hail. Hail damage to vehicles is expected. expect wind damage to roofs, siding, and trees. Locations impacted include, buckingham, dillwyn, wingina, gold hill, and centenary. 5/20/2018 7:06 PM EDT At 706 pm edt, severe thunderstorms were located along a line extending from 6 miles north of shipman to near centenary to near fife, moving southeast at 15 mph (radar indicated). Hazards include 60 mph wind gusts and quarter size hail. Hail damage to vehicles is expected. Expect wind damage to roofs, siding, and trees. 5/10/2018 3:38 PM EDT At 337 pm edt, severe thunderstorms were located along a line extending from toga to near tower hill to concord, moving east at 35 mph (radar indicated. this storm has a history of producing hail the size of quarters). Hazards include 60 mph wind gusts and quarter size hail. Hail damage to vehicles is expected. Expect wind damage to roofs, siding, and trees. 5/10/2018 3:34 PM EDT Quarter sized hail reported 13.5 miles ENE of Dillwyn, VA, ham radio reported one inch hail on route 24. 5/10/2018 3:28 PM EDT At 327 pm edt, a severe thunderstorm was located over new canton, moving east at 50 mph (radar indicated). Hazards include 60 mph wind gusts and quarter size hail. Hail damage to vehicles is expected. expect wind damage to roofs, siding, and trees. Locations impacted include, buckingham, dillwyn, new canton, centenary, and wingina. 5/10/2018 3:19 PM EDT At 318 pm edt, a severe thunderstorm was located near centenary, moving east at 35 mph (radar indicated. at 307 pm, a trained spotter reported hail the size of quarters in madison heights). Hazards include 60 mph wind gusts and quarter size hail. Hail damage to vehicles is expected. expect wind damage to roofs, siding, and trees. Locations impacted include, buckingham, dillwyn, new canton, centenary, and riverville. 5/10/2018 2:40 PM EDT At 239 pm edt, a severe thunderstorm was located near falconerville, moving east at 35 mph (radar indicated). Hazards include 60 mph wind gusts and half dollar size hail. Hail damage to vehicles is expected. Expect wind damage to roofs, siding, and trees. 4/15/2018 8:06 PM EDT The severe thunderstorm warning for eastern buckingham county will expire at 815 pm edt, the storms which prompted the warning have moved out of the area. therefore the warning will be allowed to expire. when it is safe to do so, please send your reports of hail of any size, as well as reports of any wind damage, including downed trees or large limbs, to the national weather service by calling toll free at 1, 8 6 6, 2 1 5, 4 3 2 4. reports and pictures can also be shared on the national weather service blacksburg facebook page and on twitter. 4/15/2018 8:00 PM EDT At 800 pm edt, severe thunderstorms were located along a line extending from 7 miles southwest of lake monticello to near guinea mills, moving northeast at 65 mph (radar indicated). Hazards include 60 mph wind gusts and quarter size hail. Hail damage to vehicles is expected. expect wind damage to roofs, siding, and trees. Locations impacted include, dillwyn, new canton, centenary, gold hill, and shores. 4/15/2018 7:50 PM EDT At 750 pm edt, severe thunderstorms were located along a line extending from 6 miles east of schuyler to near guinea mills, moving east at 45 mph (radar indicated). Hazards include 60 mph wind gusts and quarter size hail. Hail damage to vehicles is expected. expect wind damage to roofs, siding, and trees. locations impacted include, buckingham, dillwyn, new canton, toga, and centenary. 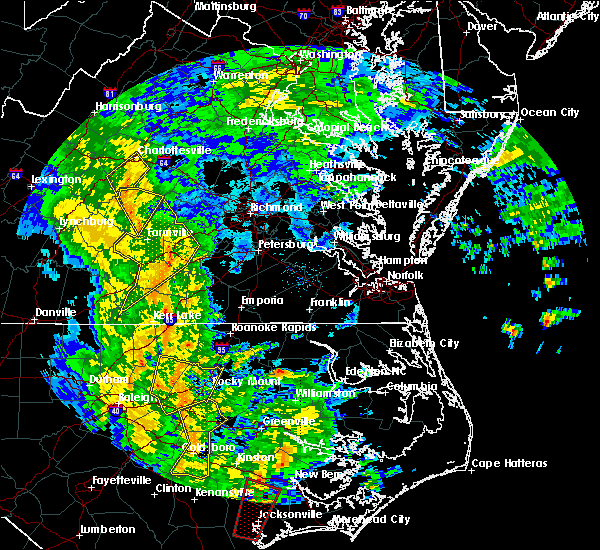 A tornado watch remains in effect until 1100 pm edt for central and south central virginia. 4/15/2018 7:22 PM EDT At 722 pm edt, severe thunderstorms were located along a line extending from near riverville to madisonville, moving northeast at 50 mph (radar indicated). Hazards include 60 mph wind gusts and quarter size hail. Hail damage to vehicles is expected. expect wind damage to roofs, siding, and trees. locations impacted include, lynchburg, buckingham, amherst, appomattox, and dillwyn. 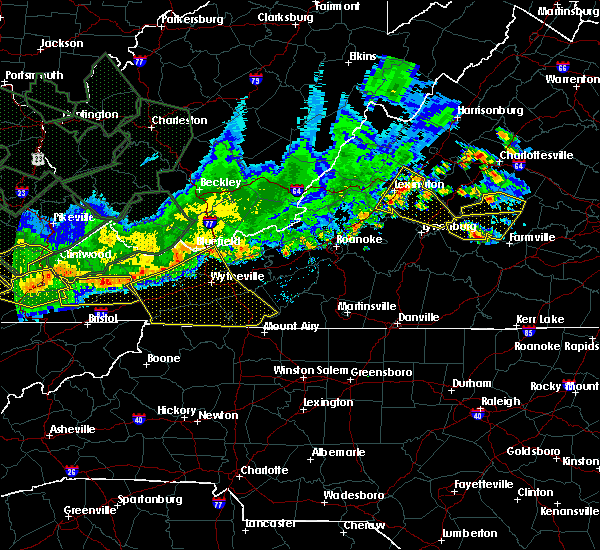 A tornado watch remains in effect until 1100 pm edt for central, south central and west central virginia. 7/18/2017 4:22 PM EDT The severe thunderstorm warning for central appomattox and central buckingham counties will expire at 430 pm edt, the storm which prompted the warning has weakened below severe limits, and has exited the warned area. therefore, the warning will be allowed to expire. when it is safe to do so, please send your reports of hail of any size, as well as reports of any wind damage, including downed trees or large limbs, to the national weather service by calling toll free at 1, 8 6 6, 2 1 5, 4 3 2 4. reports and pictures can also be shared on the national weather service blacksburg facebook page and on twitter. 7/18/2017 4:01 PM EDT At 339 pm edt, a severe thunderstorm was located over toga, moving southwest at 15 mph. a strong thunderstorm was located near evergreen moving south at 10 mph (radar indicated). Hazards include 60 mph wind gusts and quarter size hail. Hail damage to vehicles is expected. expect wind damage to roofs, siding, and trees. Locations impacted include, buckingham, appomattox, dillwyn, pamplin city, and toga. 7/18/2017 3:40 PM EDT At 339 pm edt, a severe thunderstorm was located over toga, moving southwest at 15 mph. a strong thunderstorm was located near evergreen moving south at 10 mph (radar indicated). Hazards include 60 mph wind gusts and quarter size hail. Hail damage to vehicles is expected. expect wind damage to roofs, siding, and trees. Locations impacted include, buckingham, appomattox, dillwyn, pamplin city, and toga. 7/18/2017 3:22 PM EDT At 322 pm edt, a severe thunderstorm was located over toga, moving southwest at 15 mph (radar indicated). Hazards include 60 mph wind gusts and quarter size hail. Hail damage to vehicles is expected. Expect wind damage to roofs, siding, and trees. 5/27/2017 5:22 PM EDT The severe thunderstorm warning for east central appomattox and southeastern buckingham counties will expire at 530 pm edt, the storm which prompted the warning has weakened below severe limits, and has exited the warned area. therefore, the warning will be allowed to expire. 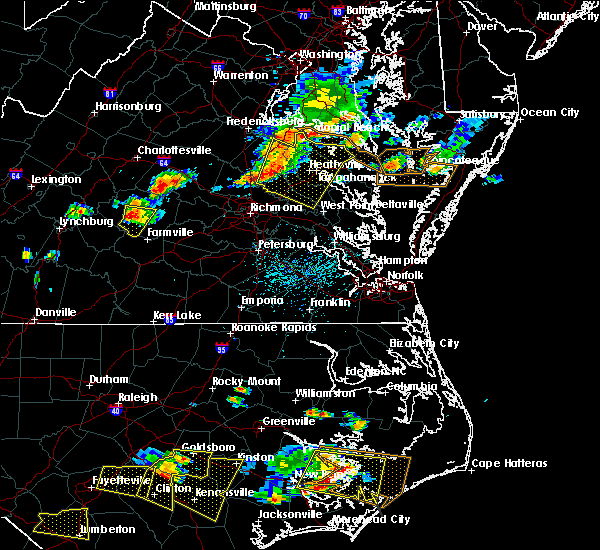 a severe thunderstorm watch remains in effect until 1000 pm edt for central and south central virginia. when it is safe to do so, please send your reports of hail of any size, as well as reports of any wind damage, including downed trees or large limbs, to the national weather service by calling toll free at 1, 8 6 6, 2 1 5, 4 3 2 4. reports and pictures can also be shared on the national weather service blacksburg facebook page and on twitter. 5/27/2017 5:03 PM EDT At 448 pm edt, a severe thunderstorm was located near sheppards, moving east at 30 mph (radar indicated). Hazards include 60 mph wind gusts and quarter size hail. Hail damage to vehicles is expected. expect wind damage to roofs, siding, and trees. Locations impacted include, buckingham, dillwyn, toga, sheppards, and andersonville. 5/27/2017 4:55 PM EDT Quarter sized hail reported 2 miles NW of Dillwyn, VA, hail ranged from pea size then increased to quarter size. 5/27/2017 4:48 PM EDT At 448 pm edt, a severe thunderstorm was located near sheppards, moving east at 30 mph (radar indicated). Hazards include 60 mph wind gusts and quarter size hail. Hail damage to vehicles is expected. expect wind damage to roofs, siding, and trees. Locations impacted include, buckingham, dillwyn, toga, sheppards, and andersonville. 5/27/2017 4:40 PM EDT Half Dollar sized hail reported 8.2 miles ENE of Dillwyn, VA, photo submitted of half-dollar size hail in andersonville. 5/27/2017 4:33 PM EDT At 433 pm edt, a severe thunderstorm was located near toga, moving southeast at 30 mph (radar indicated). Hazards include 60 mph wind gusts and quarter size hail. Hail damage to vehicles is expected. Expect wind damage to roofs, siding, and trees. 5/5/2017 6:03 AM EDT At 602 am edt, severe thunderstorms were located along a line extending from near centenary to near guinea mills, moving northeast at 40 mph (radar indicated). Hazards include 60 mph wind gusts. Expect damage to trees and power lines. Locations impacted include, buckingham, dillwyn, new canton, gold hill, and centenary. 5/5/2017 5:32 AM EDT At 531 am edt, severe thunderstorms were located along a line extending from near shipman to evergreen, moving northeast at 40 mph (radar indicated). Hazards include 60 mph wind gusts. Expect damage to trees and power lines. Locations impacted include, buckingham, appomattox, dillwyn, bent creek, and pamplin city. 5/1/2017 6:21 PM EDT The severe thunderstorm warning for buckingham county will expire at 630 pm edt, the storm which prompted the warning has weakened below severe limits, and has exited the warned area. therefore, the warning will be allowed to expire. 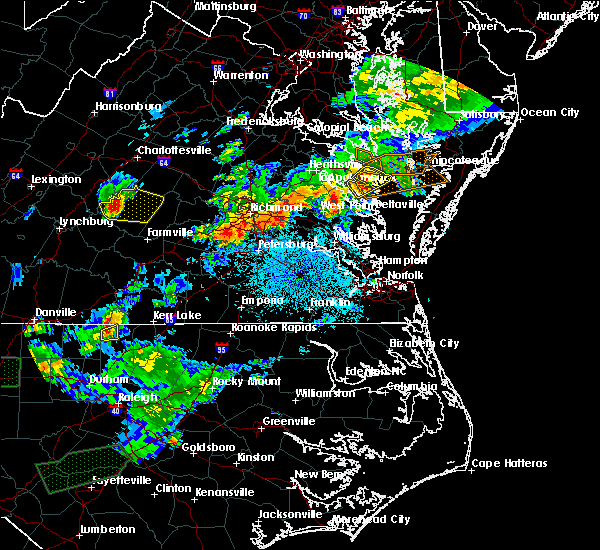 a severe thunderstorm watch remains in effect until 1100 pm edt for central and south central virginia. when it is safe to do so, please send your reports of hail of any size, as well as reports of any wind damage, including downed trees or large limbs, to the national weather service by calling toll free at 1, 8 6 6, 2 1 5, 4 3 2 4. reports and pictures can also be shared on the national weather service blacksburg facebook page and on twitter. 5/1/2017 6:17 PM EDT At 616 pm edt, a severe thunderstorm was located near buckingham, moving northeast at 25 mph (radar indicated). Hazards include 60 mph wind gusts and quarter size hail. Minor damage to vehicles is possible. expect wind damage to trees and power lines. Locations impacted include, buckingham, dillwyn, toga, centenary, and andersonville. 5/1/2017 6:01 PM EDT At 600 pm edt, a severe thunderstorm was located near wingina, moving northeast at 45 mph (radar indicated). Hazards include 60 mph wind gusts and quarter size hail. Minor damage to vehicles is possible. expect wind damage to trees and power lines. Locations impacted include, buckingham, appomattox, dillwyn, bent creek, and toga. 5/1/2017 5:35 PM EDT At 534 pm edt, a severe thunderstorm was located near wingina, moving northeast at 35 mph. a second strong thunderstorm was located just east of concord moving northeast at 40 mph (radar indicated). Hazards include 60 mph wind gusts and quarter size hail. Minor damage to vehicles is possible. expect wind damage to trees and power lines. Locations impacted include, buckingham, appomattox, dillwyn, bent creek, and appomattox national historic park. 5/1/2017 5:16 PM EDT At 515 pm edt, a severe thunderstorm was located over oakville, moving northeast at 25 mph (radar indicated). Hazards include 60 mph wind gusts and quarter size hail. Minor damage to vehicles is possible. Expect wind damage to trees and power lines. 3/1/2017 1:14 PM EST At 114 pm est, severe thunderstorms with a history of producing wind damage were located along a line extending from near centenary to near toga to near appomattox, moving east at 55 mph (radar indicated). Hazards include 60 mph wind gusts. Expect damage to roofs, siding, and trees. Locations impacted include, buckingham, appomattox, dillwyn, bent creek, and appomattox national historic park. 9/28/2016 7:55 PM EDT At 754 pm edt, severe thunderstorms were located along a line extending from near centenary to near gold hill to near dillwyn, moving east at 30 mph (radar indicated). Hazards include 60 mph wind gusts and quarter size hail. Hail damage to vehicles is expected. expect wind damage to roofs, siding, and trees. Locations impacted include, buckingham, dillwyn, new canton, centenary, and gold hill. 9/28/2016 7:21 PM EDT At 721 pm edt, severe thunderstorms were located along a line extending from near wingina to near buckingham to near toga, moving east at 35 mph (radar indicated). Hazards include 60 mph wind gusts and quarter size hail. Hail damage to vehicles is expected. expect wind damage to roofs, siding, and trees. Locations impacted include, buckingham, dillwyn, new canton, centenary, and gold hill. 9/28/2016 7:07 PM EDT At 706 pm edt, severe thunderstorms were located along a line extending from near wingina to near bent creek to tower hill, moving east at 35 mph (radar indicated). Hazards include 60 mph wind gusts and quarter size hail. Hail damage to vehicles is expected. Expect wind damage to roofs, siding, and trees. 8/15/2016 7:03 PM EDT At 703 pm edt, severe thunderstorms were located along a line extending from 8 miles east of schuyler to centenary to near toga, moving northeast at 30 mph (radar indicated). Hazards include 60 mph wind gusts. Expect damage to roofs. siding. and trees. Locations impacted include, buckingham, dillwyn, new canton, centenary, and andersonville. 8/15/2016 6:41 PM EDT At 640 pm edt, severe thunderstorms were located along a line extending from 7 miles south of schuyler to wingina to near toga, moving northeast at 25 mph (radar indicated). Hazards include 60 mph wind gusts. Expect damage to roofs. siding. And trees. 7/31/2016 7:24 PM EDT The severe thunderstorm warning for buckingham county will expire at 730 pm edt, the storm which prompted the warning has weakened below severe limits, and no longer poses an immediate threat to life or property. therefore the warning will be allowed to expire. however gusty winds and heavy rain are still possible with this thunderstorm. when it is safe to do so, please send your reports of hail of any size, as well as any reports of wind damage, including downed trees or large limbs, to the national weather service by calling toll free at 1, 8 6 6, 2 1 5, 4 3 2 4. reports and pictures can also be shared on the national weather service blacksburg facebook page and on twitter. 7/31/2016 6:47 PM EDT At 646 pm edt, a severe thunderstorm was located near buckingham, and is nearly stationary (radar indicated). Hazards include 60 mph wind gusts. Expect damage to roofs. siding. and trees. Locations impacted include, buckingham, dillwyn, andersonville, toga, and sheppards. 7/31/2016 6:25 PM EDT At 625 pm edt, a severe thunderstorm was located near wingina, moving southeast at 25 mph (radar indicated). Hazards include 60 mph wind gusts. Expect damage to roofs. siding. And trees. 7/30/2016 8:05 PM EDT At 804 pm edt, a severe thunderstorm was located near tower hill, moving southeast at 20 mph (radar indicated). Hazards include 60 mph wind gusts and quarter size hail. Hail damage to vehicles is expected. expect wind damage to roofs, siding, and trees. nearly continuous lightning can be expected with this storm. Locations impacted include, buckingham, dillwyn, bent creek, oakville, and andersonville. 7/30/2016 7:53 PM EDT At 753 pm edt, a severe thunderstorm was located over tower hill, moving southeast at 10 mph (radar indicated). Hazards include 60 mph wind gusts and quarter size hail. Hail damage to vehicles is expected. expect wind damage to roofs, siding, and trees. Locations impacted include, buckingham, dillwyn, bent creek, oakville, and andersonville. 7/30/2016 7:41 PM EDT At 741 pm edt, a severe thunderstorm was located over bent creek, moving east at 25 mph (radar indicated). Hazards include 60 mph wind gusts. Expect damage to roofs. siding. And trees. 7/30/2016 5:40 PM EDT The severe thunderstorm warning for central buckingham county will expire at 545 pm edt, the storm which prompted the warning has weakened below severe limits, and no longer poses an immediate threat to life or property. therefore the warning will be allowed to expire. however gusty winds are still possible with this thunderstorm. when it is safe to do so, please send your reports of hail of any size, as well as any reports of wind damage, including downed trees or large limbs, to the national weather service by calling toll free at 1, 8 6 6, 2 1 5, 4 3 2 4. reports and pictures can also be shared on the national weather service blacksburg facebook page and on twitter. 7/30/2016 5:24 PM EDT At 524 pm edt, a severe thunderstorm was located over buckingham, moving southeast at 15 mph (radar indicated). Hazards include 60 mph wind gusts. Expect damage to roofs. siding. and trees. Locations impacted include, buckingham, dillwyn, new canton, centenary, and gold hill. 7/30/2016 5:02 PM EDT At 501 pm edt, a severe thunderstorm was located just east of wingina, moving southeast at 15 mph (radar indicated). Hazards include 60 mph wind gusts. Expect damage to roofs. siding. and trees. Locations impacted include, buckingham, dillwyn, new canton, centenary, and wingina. 7/30/2016 4:44 PM EDT At 443 pm edt, a severe thunderstorm was located over wingina, moving east at 25 mph (radar indicated). Hazards include 60 mph wind gusts and quarter size hail. Hail damage to vehicles is expected. Expect wind damage to roofs, siding, and trees. 7/29/2016 12:03 AM EDT At 1203 am edt, a severe thunderstorm was located near andersonville, moving east at 40 mph (radar indicated). Hazards include 60 mph wind gusts. Expect damage to roofs. siding. and trees. Locations impacted include, buckingham, dillwyn, gold hill, andersonville, and sheppards. 7/28/2016 11:49 PM EDT At 1149 pm edt, a severe thunderstorm was located near hixburg, moving east at 40 mph (radar indicated). Hazards include 60 mph wind gusts. Expect damage to roofs. siding. And trees. 7/28/2016 7:33 PM EDT At 732 pm edt, severe thunderstorms were located along a line extending from dillwyn to andersonville to hixburg, moving east at 40 mph (radar indicated). Hazards include 60 mph wind gusts. Expect damage to roofs. siding. and trees. Locations impacted include, buckingham, dillwyn, hixburg, andersonville, and toga. 7/28/2016 7:10 PM EDT At 709 pm edt, severe thunderstorms were located along a line extending from wingina to near toga to appomattox national historic park, moving east at 30 mph (radar indicated). Hazards include 60 mph wind gusts. Expect damage to roofs. siding. And trees. 7/16/2016 6:38 PM EDT The severe thunderstorm warning for eastern buckingham county will expire at 645 pm edt, the storms which prompted the warning have weakened below severe limits, and have exited the warned area. therefore the warning will be allowed to expire. light to moderate rain and occasional lightning will continue in the area for another 30 minutes or so. when it is safe to do so, please send your reports of hail of any size, as well as any reports of wind damage, including downed trees or large limbs, to the national weather service by calling toll free at 1, 8 6 6, 2 1 5, 4 3 2 4. reports and pictures can also be shared on the national weather service blacksburg facebook page and on twitter. 7/16/2016 6:15 PM EDT At 615 pm edt, severe thunderstorms were located along a line extending from near columbia to near dillwyn, moving east at 25 mph (radar indicated). Hazards include 60 mph wind gusts. Expect damage to roofs. siding. and trees. Locations impacted include, dillwyn, new canton, and gold hill. 7/16/2016 5:51 PM EDT At 550 pm edt, severe thunderstorms were located along a line extending from near fork union to near buckingham, moving southeast at 25 mph (radar indicated). Hazards include 60 mph wind gusts. Expect damage to roofs. siding. And trees. 6/23/2016 6:01 AM EDT At 600 am edt, severe thunderstorms were located along a line extending from near centenary to near cumberland, moving east at 40 mph (radar indicated). Hazards include 60 mph wind gusts and quarter size hail. Hail damage to vehicles is expected. expect wind damage to roofs, siding, and trees. Locations impacted include, dillwyn, new canton, centenary, and gold hill. 6/23/2016 5:45 AM EDT At 544 am edt, severe thunderstorms were located along a line extending from near centenary to near dillwyn, moving east at 40 mph (radar indicated). Hazards include 60 mph wind gusts and quarter size hail. Hail damage to vehicles is expected. expect wind damage to roofs, siding, and trees. Locations impacted include, buckingham, dillwyn, new canton, centenary, and wingina. 6/23/2016 5:29 AM EDT At 528 am edt, a severe thunderstorm was located over wingina, moving east at 40 mph (radar indicated). Hazards include 60 mph wind gusts and quarter size hail. Hail damage to vehicles is expected. Expect wind damage to roofs, siding, and trees. 6/16/2016 9:42 PM EDT The severe thunderstorm warning for central appomattox. 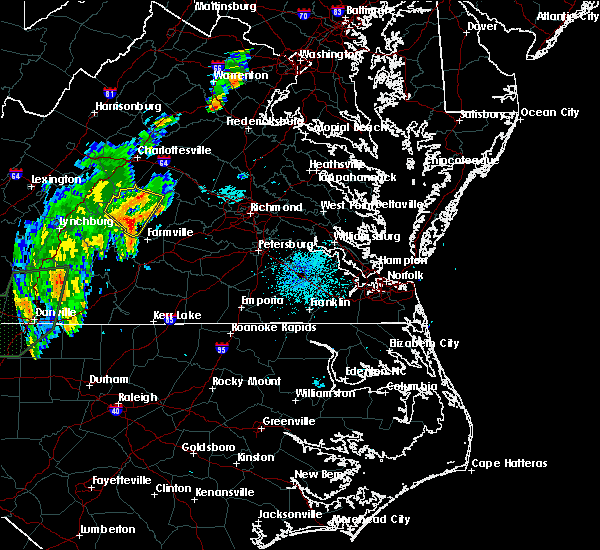 southeastern amherst and buckingham counties will expire at 945 pm edt. the storms which prompted the warning have moved out of the area. therefore the warning will be allowed to expire. however. Gusty winds and heavy rain from an additional line are still possible with. 6/16/2016 9:26 PM EDT At 926 pm edt, severe thunderstorms producing very heavy wind gusts were located along a line extending from near lakeside village through dillwyn to near tower hill, moving southeast at 30 mph (radar indicated). Hazards include 60 mph wind gusts and quarter size hail. Hail damage to vehicles is expected. expect wind damage to roofs, siding, and trees. Locations impacted include, buckingham, amherst, appomattox, dillwyn, and bent creek. 6/16/2016 9:02 PM EDT At 902 pm edt, severe thunderstorms were located along a line extending from 6 miles east of centenary to near wingina to near shipman, moving southeast at 30 mph (radar indicated). Hazards include 60 mph wind gusts and quarter size hail. Hail damage to vehicles is expected. expect wind damage to roofs, siding, and trees. Locations impacted include, buckingham, amherst, appomattox, dillwyn, and clifford. 6/16/2016 8:47 PM EDT At 846 pm edt, severe thunderstorms were located along a line extending from 7 miles north of centenary through shipman to near lowesville, moving southeast at 30 mph (radar indicated). Hazards include 60 mph wind gusts and quarter size hail. Hail damage to vehicles is expected. Expect wind damage to roofs, siding, and trees. 6/2/2016 7:57 PM EDT The severe thunderstorm warning for east central appomattox and central buckingham counties will expire at 800 pm edt. the storms which prompted the warning have weakened below severe limits. and no longer pose an immediate threat to life or property. therefore the warning will be allowed to expire. however. Heavy rain is still possible with these thunderstorms. 6/2/2016 7:29 PM EDT At 728 pm edt, severe thunderstorms were located along a line extending from near dillwyn to sheppards to near appomattox national historic park, moving southeast at 40 mph (radar indicated). Hazards include 60 mph wind gusts. Expect damage to roofs. siding. and trees. Locations impacted include, dillwyn, hixburg, and appomattox national historic park. 6/2/2016 6:57 PM EDT At 656 pm edt, severe thunderstorms were located along a line extending from near centenary to near riverville, moving southeast at 30 mph (radar indicated). Hazards include 60 mph wind gusts. Expect damage to roofs. siding. And trees. 4/28/2016 8:24 PM EDT At 824 pm edt, a severe thunderstorm was located near dillwyn, moving east at 40 mph (public). Hazards include 60 mph wind gusts and quarter size hail. Hail damage to vehicles is expected. Expect wind damage to roofs, siding, and trees. 2/24/2016 4:38 PM EST The severe thunderstorm warning for buckingham county will expire at 445 pm est, the storms which prompted the warning have moved out of the area. therefore the warning will be allowed to expire. however heavy rain is still possible with these thunderstorms. a tornado watch remains in effect until 900 pm est for south central virginia. when it is safe to do so, please send your reports of hail of any size, as well as any reports of wind damage, including downed trees or large limbs, to the national weather service by calling toll free at 1, 8 6 6, 2 1 5, 4 3 2 4. reports and pictures can also be shared on the national weather service blacksburg facebook page and on twitter. 2/24/2016 4:23 PM EST At 423 pm est, severe thunderstorms were located along a line extending from near new canton to near guinea mills, moving northeast at 50 mph (radar indicated). Hazards include 60 mph wind gusts. Expect damage to roofs. siding. and trees. locations impacted include, buckingham, dillwyn, new canton, andersonville, and gold hill. A tornado watch remains in effect until 900 pm est for south central virginia. 2/24/2016 3:54 PM EST At 354 pm est, a severe thunderstorm capable of producing a tornado was located over buckingham, moving northeast at 60 mph (radar indicated rotation). Hazards include tornado. Flying debris will be dangerous to those caught without shelter. mobile homes will be damaged or destroyed. damage to roofs, windows, and vehicles will occur. tree damage is likely. this dangerous storm will be near, gold hill around 405 pm est. New canton around 410 pm est. 2/24/2016 3:45 PM EST At 345 pm est, a severe thunderstorm capable of producing a tornado was located near andersonville, moving northeast at 55 mph (radar indicated rotation). Hazards include tornado. Flying debris will be dangerous to those caught without shelter. mobile homes will be damaged or destroyed. damage to roofs, windows, and vehicles will occur. tree damage is likely. this dangerous storm will be near, andersonville and sheppards around 350 pm est. buckingham around 355 pm est. Dillwyn around 400 pm est. 2/24/2016 3:39 PM EST At 338 pm est, severe thunderstorms were located along a line extending from near wingina to near appomattox national historic park, moving northeast at 60 mph (radar indicated). Hazards include 60 mph wind gusts. Expect damage to roofs. siding. And trees. 7/14/2015 8:51 PM EDT At 850 pm edt, a severe thunderstorm was located near sheppards, moving east at 25 mph (radar indicated). Hazards include 60 mph wind gusts and quarter size hail. Hail damage to vehicles is expected. expect wind damage to roofs, siding and trees. Locations impacted include, buckingham, appomattox, dillwyn, bent creek, and oakville. 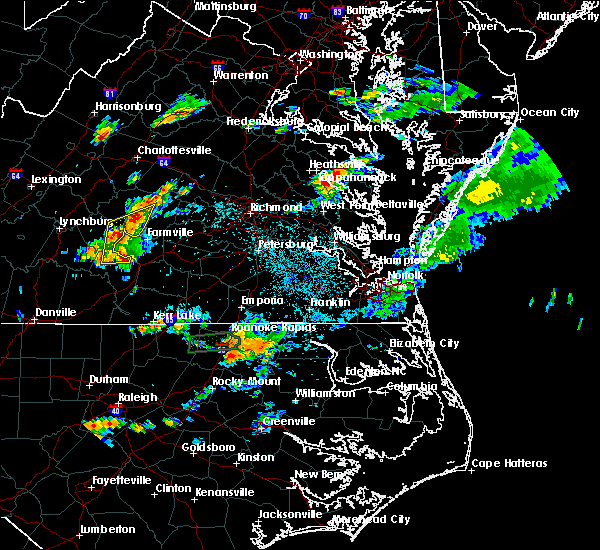 7/14/2015 8:20 PM EDT At 819 pm edt, a severe thunderstorm was located near appomattox national historic park, moving east at 25 mph (radar indicated). Hazards include 60 mph wind gusts and quarter size hail. Hail damage to vehicles is expected. expect wind damage to roofs, siding and trees. Locations impacted include, buckingham, appomattox, dillwyn, bent creek, and oakville. 7/14/2015 8:07 PM EDT At 806 pm edt, a severe thunderstorm was located over oakville, moving east at 30 mph (radar indicated). Hazards include 60 mph wind gusts and quarter size hail. Hail damage to vehicles is expected. expect wind damage to roofs, siding and trees. Locations impacted include, buckingham, appomattox, dillwyn, bent creek, and oakville. 7/14/2015 7:55 PM EDT At 755 pm edt, a severe thunderstorm was located over oakville, moving east at 30 mph (radar indicated). Hazards include 60 mph wind gusts and quarter size hail. Hail damage to vehicles is expected. Expect wind damage to roofs, siding and trees. 7/13/2015 9:18 PM EDT At 917 pm edt, a severe thunderstorm was located near sheppards, moving southeast at 30 mph (radar indicated). Hazards include 60 mph wind gusts. Expect damage to roofs. siding and trees. Locations impacted include, buckingham, dillwyn, toga, andersonville, and sheppards. 7/13/2015 9:02 PM EDT At 902 pm edt, a severe thunderstorm was located over andersonville, moving southeast at 30 mph (radar indicated). Hazards include 60 mph wind gusts and quarter size hail. Hail damage to vehicles is expected. expect wind damage to roofs, siding and trees. Locations impacted include, buckingham, dillwyn, gold hill, toga, and sheppards. 7/13/2015 8:31 PM EDT At 830 pm edt, a severe thunderstorm was located near wingina, moving southeast at 30 mph. another severe thunderstorm was located near centenary, almost moving southeast at 30 mph (radar indicated). Hazards include 60 mph wind gusts and quarter size hail. Hail damage to vehicles is expected. Expect wind damage to roofs, siding and trees. 6/27/2015 8:25 PM EDT At 821 pm edt, severe thunderstorms were located along a line extending from near bent creek to stonewall, moving east at 20 mph (radar indicated). Hazards include 60 mph wind gusts and quarter size hail. Hail damage to vehicles is expected. expect wind damage to roofs, siding and trees. Locations impacted include, buckingham, appomattox, dillwyn, concord, and bent creek. 6/27/2015 7:59 PM EDT At 758 pm edt, severe thunderstorms extended from madison heights to oakville, and were moving east at 25 mph (radar indicated). Hazards include 60 mph wind gusts. Expect damage to roofs. siding and trees. Locations impacted include, lynchburg, buckingham, appomattox, dillwyn, and concord. 6/27/2015 7:31 PM EDT At 730 pm edt, a severe thunderstorm was located near madison heights, moving east at 20 mph (radar indicated). Hazards include 60 mph wind gusts. Expect damage to roofs. Siding and trees. 6/20/2015 7:54 PM EDT The severe thunderstorm warning for buckingham county will expire at 800 pm edt, the storm which prompted the warning has moved out of the area. therefore the warning will be allowed to expire. 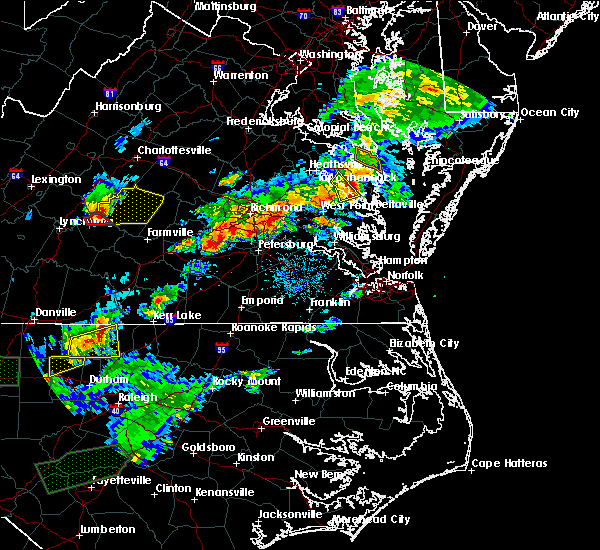 a severe thunderstorm watch remains in effect until 1100 pm edt for south central virginia. when it is safe to do so, please send your reports of hail of any size, as well as any reports of wind damage, including downed trees or large limbs, to the national weather service by calling toll free at 1, 8 6 6, 2 1 5, 4 3 2 4. reports and pictures can also be shared on the national weather service blacksburg facebook page and on twitter. 6/20/2015 7:35 PM EDT At 735 pm edt, a severe thunderstorm was located over gold hill, moving northeast at 35 mph (radar indicated). Hazards include 60 mph wind gusts. Expect damage to roofs. siding and trees. Locations impacted include, buckingham, dillwyn, new canton, centenary, and gold hill. 6/20/2015 7:05 PM EDT At 705 pm edt, a severe thunderstorm was located over andersonville, moving northeast at 35 mph (radar indicated). Hazards include 60 mph wind gusts. Expect damage to roofs. Siding and trees. 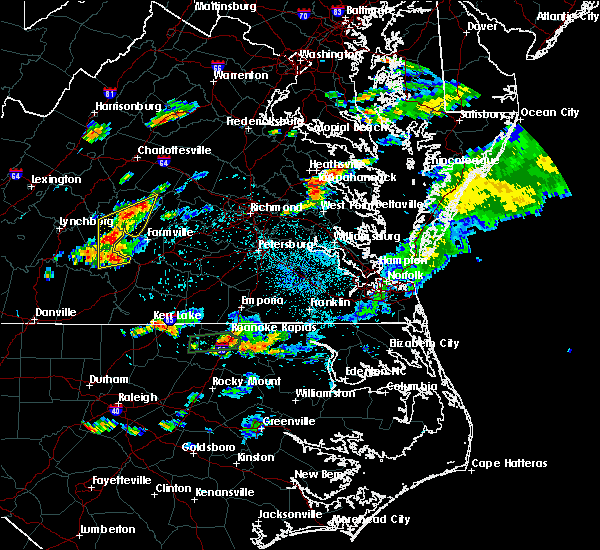 6/18/2015 5:03 PM EDT At 502 pm edt, severe thunderstorms were located along a line extending from near sheppards to hixburg, moving southeast at 15 mph (radar indicated). Hazards include 60 mph wind gusts. Expect damage to roofs. siding and trees. Locations impacted include, dillwyn, sheppards, andersonville, and toga. 6/18/2015 4:21 PM EDT At 421 pm edt, severe thunderstorms were located along a line extending from near centenary to near riverville, moving east at 15 mph (radar indicated). Hazards include 60 mph wind gusts. Expect damage to roofs. Siding and trees. 1/1/0001 12:00 AM Golf Ball sized hail reported 10.2 miles SW of Dillwyn, VA, golf ball size hail reported at the intersection of route 718 and 15.